The Manning Park Donut Hole has got to be one of the strangest names for a wilderness area we’ve ever seen. As it’s name suggests, this area is a “hole” in provincial park protection afforded to the parkland that surrounds it. In 1996 The Skagit Valley in southwest BC had its protected area status upgraded by the BC government from Recreation Area to Class A Provincial Park. However a portion of the Skagit watershed that was covered under a mineral tenure was left out of the new park. The mineral tenure area was completely surrounded by Skagit and Manning provincial parks and soon people were referring to it as the Manning Park Donut Hole and the nick-name stuck. The 5,800 hectare Donut Hole is comprised of Smitheram Valley, Silverdaisy Valley and 26 Mile Valley. See locator map below. At first only mineral exploration was allowed in the Donut Hole. But in 2003 the BC government quietly opened the forests in the Donut Hole to logging, even though it had been designated important spotted owl habitat. 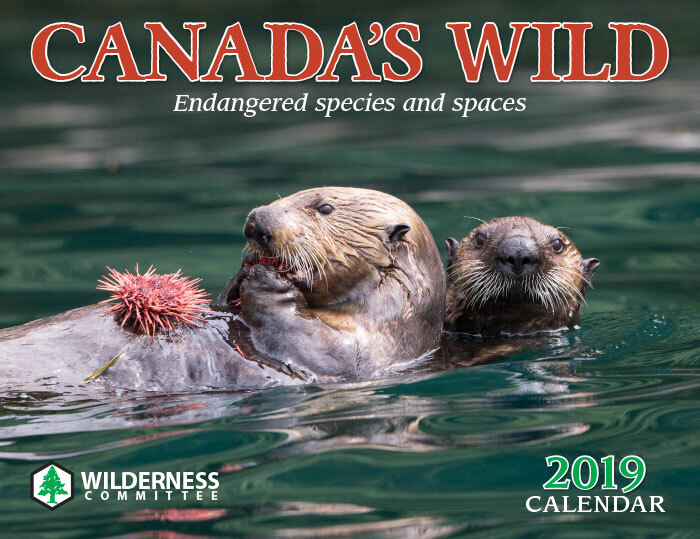 At the Wilderness Committee we were surprised and shocked to discover a BC government approved logging operation inside the Donut Hole in 2004 chainsawing down spotted owl habitat forest. We protested the logging but were unable to stop it. In 2008 the BC government designated all the lower slope forests within the Donut Hole as Wildlife Habitat Areas, fully protected for the conservation of spotted owl habitat. This entire region in the Cascade Mountains, including the Donut Hole has been designated as BC’s top priority for grizzly bear recovery. By the early summer of 2018 BC Timber Sales was back building logging roads in the Manning Park Donut Hole – this time in high elevation grizzly habitat. As soon as we found out about the new logging plans we scrambled to oppose them. See logging map below. Then in early 2019 Imperial Metal's applied for a 5-year exploration permit for the Donut Hole. Our campaign is centred on stopping the logging plans, and convincing the BC government to also stop all future mine exploration plans then designate the Donut Hole as a protected area added to the BC Provincial Park system. Below is a map showing approved logging cutblocks (red outline) and roads (purple lines), that are being cleared and constructed through Summer and Fall 2018 in Smitheram Creek Valley. Cutblocks SD102, SD103 and SD104 have already been logged between July and October 2018. Cutblock SD105 is being logged through November 2018. Map below also shows BCTS future planned 2019 cutblocks (orange outline), previously planned 2020 & 2022 cutblocks (purple outline) and roads (brown lines) in Silverdaisy Creek and 26 Mile Creek Valleys. 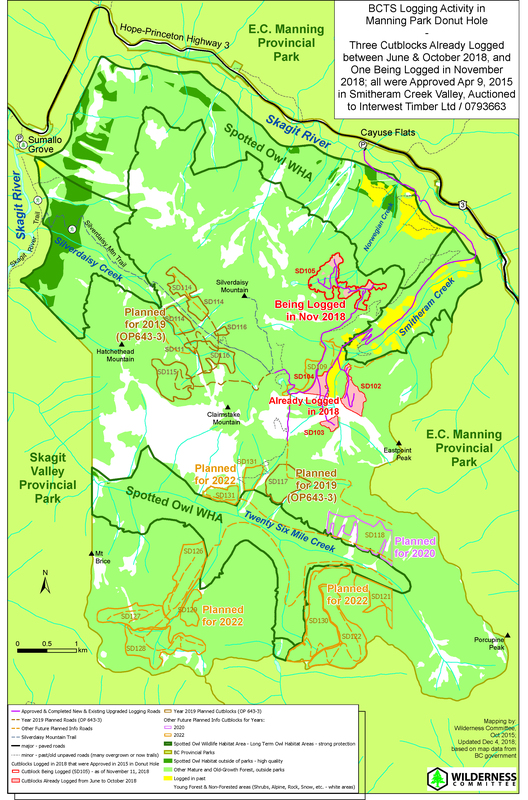 Also shown are Spotted Owl Wildlife Habitat Areas (yellowish areas) and Manning and Skagit Valley Provincial Parks (green areas).